A stay-at-home father made a harrowing 999 call telling the operator 'my little girl has fallen down' in a 'lying call' made two hours after he battered the six-year-old to death in a fit of rage, a court heard today. 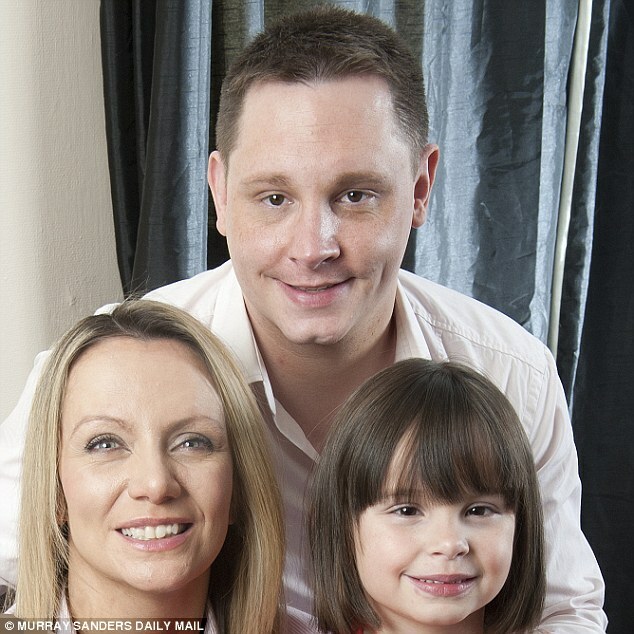 Ellie Butler was found by medics with 'catastrophic head injuries' in her bedroom in October 2013. Her parents, Ben Butler and Jennie Gray, both 36, called 999 two hours after she was fatally hurt while home alone with her father, the court has heard. Gray can be heard screaming for help during the mostly-inaudible call while Butler tells the operator his daughter was injured after she 'fell down'. The prosecution at the Old Bailey in London claims a post-mortem examination ruled out an accidental fall and her death was put down to Butler either beating her over the head with a heavy object or throwing her against the floor or wall. Butler, of Sutton, south-west London, denies Ellie's murder and along with Gray has pleaded not guilty to child cruelty over an earlier shoulder injury. 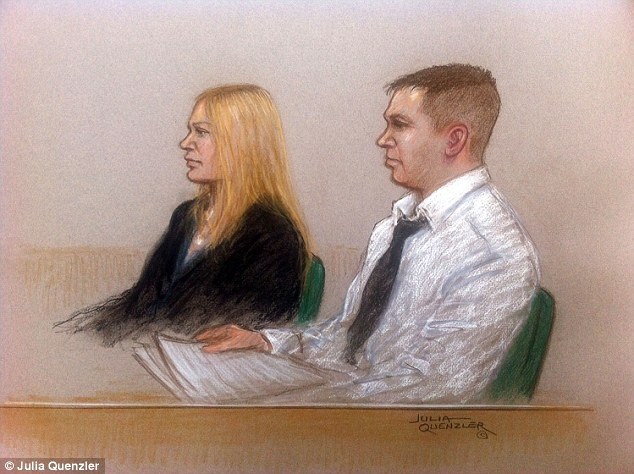 Graphic designer Gray has admitted perverting the course of justice by hiding or destroying evidence after rushing home from work to protect her partner. Gray is then instructed to give her daughter CPR with breaths followed by 30 chest compressions. As the call was played, Gray broke down in tears in the dock. Butler, who police found had sent hundreds of abusive text messages to his partner, sighed, looked at the floor and at one point reached across the dock to take Gray's hand. Much of the call was inaudible with screaming and shouting as the operator repeatedly tells the couple to 'calm down'. First responder Sarah Hardy told the court that Ellie was 'very cold and blue' when she arrived. Much of the 15-minute 999 call played to the jury was inaudible, but Gray is heard desperately pleading for help while Butler talks in the background. Gray: 'Listen to me now. My daughter's not breathing properly, she's collapsed, she's not moving and I have to get an ambulance. Can you tell me what to do please? Butler: 'I just come upstairs, my little girl has fallen down...and she's laying there, she's always falling. Butler later snaps and shouts at the operator after being asked repeatedly to provide their address. The recording then becomes inaudible due to the volume of shouting. She found the little girl in her pyjamas, lying on the floor of her bedroom, as her mother carried out CPR. The medic said Ellie had no heartbeat to shock. She said: 'I asked mum and dad what had happened. Father replied he had seen something like foam coming out of her mouth and does that mean she might be all right. 'I asked again what had happened to her and I believe her dad said 'I don't know. I thought she was in her bedroom sleeping'. More medics arrived and they continued to try to save Ellie but there was no change in her condition. Ms Hardy told jurors she could not understand how Ellie could have died until she noticed a 'boggy mass' on the back of her head. She said: 'Since I felt the boggy mass I realised the cause of death was a traumatic cardiac arrest. She also noticed a red liquid coming from her nose or mouth filling up the little girl's face mask. Ambulance crew member Penny Robson told jurors of her 'devastation' at finding a boggy mass while repositioning Ellie's head. She went on to describe seeing fluid that 'looked like tomato soup' coming from the child's mouth or nose. The witness, who took over basic life support from Ms Hardy, told jurors that Butler appeared 'hysterical'. When more help turned up, Neil Fisher then tried to find out from the mother how Ellie had been hurt. Mr Fisher told jurors that it was 'very unusual' to find a child in cardiac arrest, and he asked Gray what had happened. Cross-examining, Bernard Tetlow QC for Gray queried if Ms Hardy had really heard the mother talking about having cupcakes again with Ellie. 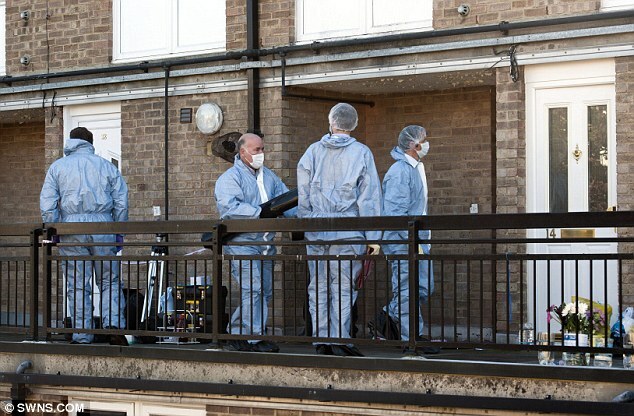 The 'urgent' 999 call was apparently made just moments after they had discovered their daughter's lifeless body on the bedroom floor of their family home in Sutton, south London. Paramedics arrived minutes after to find Ellie lying on her back next to an overturned stool, with injuries more commonly associated with car crash victims. But the jury had been told earlier how the phone call was made more than two hours after Ellie suffered 'catastrophic head injuries' that were commonly seen in 'car-crash victims'. The prosecution say both parents already knew their daughter's fate and had spent those hours plotting a 'carefully coordinated and elaborate' cover-up to make it look as though Ellie had died in a tragic accident. Earlier, the court had heard evidence from two neighbours, including Elaine Winson, who said she saw Butler outside the family home with his Jack Russell puppy just 15 minutes before the 999 call was made. He commented on the weather saying 'Isn't it nasty', which she thought was odd. Later, Ms Winson described seeing Butler's blank expression as Ellie was taken to an ambulance outside. She said: 'As they were bringing the little girl out on a trolley paramedics were working on her giving CPR. 'The mother was severely distressed and holding on to the trolley. 'The father was behind. He had no expression on his face. There was nothing. Marion Cook was on good neighbourly terms with the Butler family and looked after their puppy after Ellie was taken to hospital. When Gray came to collect the dog a couple of days later, she 'broke down in tears', she said. Ms Cook said that Gray had told her Ellie 'fell off her bed and hit her head on a radiator'. This is the moment Ellie Butler's panicking mother hailed a cab home after her husband allegedly told her he had murdered their daughter. 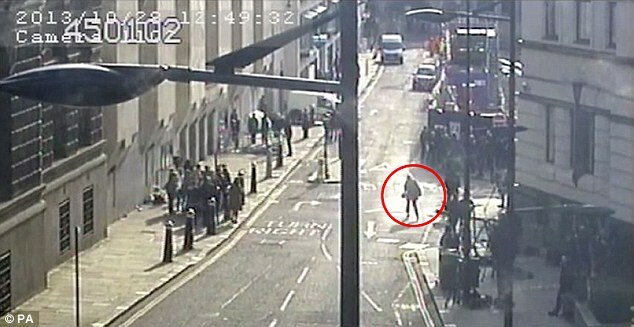 In CCTV footage from October 2013, Jennie Gray can be seen running from her central London office desperate to get a taxi back to her family address in Sutton, 12 miles away. 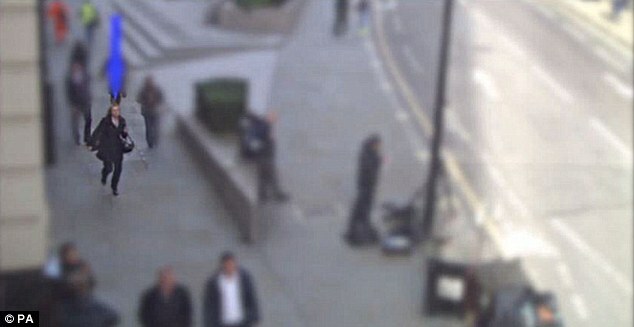 Dressed all in black, she was picked up by Derek Greenwood outside her offices. He then claimed to have heard Gray making frantic phone calls to her abusive partner Ben Butler as she rushed home from work. The prosecution say Gray - who had raced out of work shortly before - was talking to her partner Ben Butler, also 36, who had phoned her minutes before to tell him that he had killed their little girl, Ellie. The jury was told how, after arriving home an hour later, Gray spent another 60 minutes helping Butler stage a scene in Ellie's bedroom to make it appear as though the youngster had died in a tragic fall. He said: 'She seemed keen and desperate to get a cab. Mr Greenwood said Gray ended up paying him just under £50 for the journey. He said it was only the next day, when he heard on the news that a child had died, that he thought the fare might be significant. The jury were also shown CCTV footage of Gray's desperate dash home amid a flurry of phone calls and texts with Butler. The court was told Butler first tried to call at 12.46pm but was diverted to voicemail. Seconds later, he texted 'answer'. Telephone records show she called him back immediately and they spoke for 21 seconds. Two minutes later, Gray was caught on camera hurrying out of her office at 20 Old Bailey, before dashing across the street running past the court - where she is now standing trial - to hail down the taxi. In a statement read to the court, Tracey Bernstein, a colleague who worked alongside Gray at Octopus Investment, described the moment the graphic designer left work. Bullying stay-at-home father Ben Butler allegedly killed his daughter less than a year after she was returned to her family home when his conviction for assaulting her was quashed, the jury was told today. Ellie was put into foster care in 2007 after her father was found guilty of causing her serious injuries when she was a baby. But when his conviction was quashed in 2010, Butler and his besotted partner launched a successful custody bid in the High Court. Just 11 months after being returned to the 'toxic' family home, the little girl was found dead on her bedroom floor with injuries usually associated with car crash victims. Ed Brown QC, prosecuting, told the jury: 'In 2007, when she was six weeks old, she was taken to hospital with serious head injuries. 'Ben Butler was charged with assaulting her and causing those injuries. Ben Butler was tried and convicted by the jury. However, he appealed and his conviction was quashed by the Court of Appeal on June 17, 2010. 'By then Ellie had been fostered and proceedings were commenced in the High Court by Ben Butler and Jennie Gray for the return of Ellie to their care. Those proceedings were successful. Text messages read out in court revealed the 'torrent of verbal abuse' which Ben Butler regularly unleashed on his subservient partner, including called her a 'dog w****, 'fat loser' and an 'ugly b****'. Butler, 35, repeatedly sent angry messages to his partner Jennie Gray, threatening violence, criticising her comments and even once saying: 'Stay out of my way'. The exchange of messages also showed Butler's 'expressions of hatred towards Ellie' and how 'her very existence in his life caused frustration and anger in him'. Two minutes later he said: 'if u dont do wot I want im bashing u.' In other texts, Butler says he 'can't cope', is 'in a rage' or 'ready to flip'. Reading the messages to the jury, prosecutor Ed Brown said Gray responded by trying to appease him, telling Butler: 'I luv U and want U.' Another sent in August said: 'Just so U know - I am obsessed and in awe of U! In a later text, she wrote: 'I would die for U x'. But the court was told how besotted Gray also wrote letters begging for Butler to stop his behaviour. She even carried out Google searches such as 'magic spell to make him love me again' and 'magic spell to stop his hate', the court was told. Gray's diary entries, found torn up in the communal bins following Ellie's death, were also read out to jurors. Also found was a video, possibly accidently recorded on a Samsung camera. The brief clip was filmed while Butler was in the kitchen with Ellie as he is speaking on the phone. The prosecutor said Ellie's behaviour was also a concern. Internet searches on a laptop used by Gray showed searches for 'six year old urinating to be bad' and 'six year old hears a voice in her head'. A hand-written note entitled 'Ellie's behaviour' listed points including 'feel you can't trust her' and 'we feel like she is aware she is doing this'. A stay-at-home father made a harrowing 999 call telling the operator ‘my little girl has fallen down’ in a ‘lying call’ made two hours after he battered the six-year-old to death in a fit of rage, a court heard today. 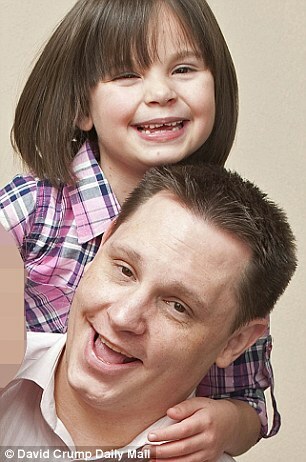 Ellie Butler was found by medics with ‘catastrophic head injuries’ in her bedroom in October 2013. Gray can be heard screaming for help during the mostly-inaudible call while Butler tells the operator his daughter was injured after she ‘fell down’. Butler, of Sutton, south-west London, denies Ellie’s murder and along with Gray has pleaded not guilty to child cruelty over an earlier shoulder injury. Butler, who police found had sent hundreds of abusive text messages to his partner, sighed, looked at the floor and at one point reached across the dock to take Gray’s hand. Much of the call was inaudible with screaming and shouting as the operator repeatedly tells the couple to ‘calm down’. First responder Sarah Hardy told the court that Ellie was ‘very cold and blue’ when she arrived. Gray: ‘Listen to me now. My daughter’s not breathing properly, she’s collapsed, she’s not moving and I have to get an ambulance. Can you tell me what to do please? Butler: ‘I just come upstairs, my little girl has fallen down…and she’s laying there, she’s always falling. She said: ‘I asked mum and dad what had happened. Father replied he had seen something like foam coming out of her mouth and does that mean she might be all right. ‘I asked again what had happened to her and I believe her dad said ‘I don’t know. I thought she was in her bedroom sleeping’. Ms Hardy told jurors she could not understand how Ellie could have died until she noticed a ‘boggy mass’ on the back of her head. She said: ‘Since I felt the boggy mass I realised the cause of death was a traumatic cardiac arrest. She also noticed a red liquid coming from her nose or mouth filling up the little girl’s face mask. Ambulance crew member Penny Robson told jurors of her ‘devastation’ at finding a boggy mass while repositioning Ellie’s head. She went on to describe seeing fluid that ‘looked like tomato soup’ coming from the child’s mouth or nose. The witness, who took over basic life support from Ms Hardy, told jurors that Butler appeared ‘hysterical’. Mr Fisher told jurors that it was ‘very unusual’ to find a child in cardiac arrest, and he asked Gray what had happened. 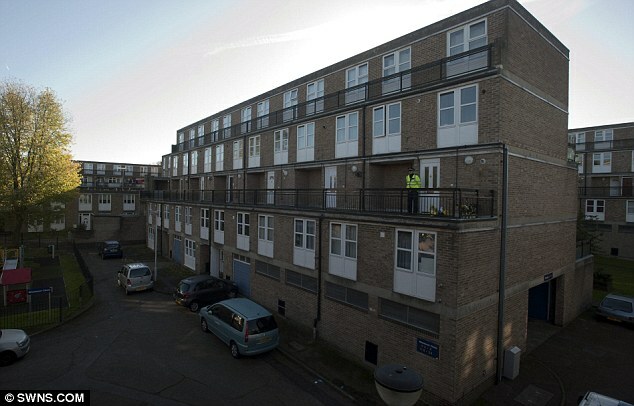 The ‘urgent’ 999 call was apparently made just moments after they had discovered their daughter’s lifeless body on the bedroom floor of their family home in Sutton, south London. But the jury had been told earlier how the phone call was made more than two hours after Ellie suffered ‘catastrophic head injuries’ that were commonly seen in ‘car-crash victims’. The prosecution say both parents already knew their daughter’s fate and had spent those hours plotting a ‘carefully coordinated and elaborate’ cover-up to make it look as though Ellie had died in a tragic accident. He commented on the weather saying ‘Isn’t it nasty’, which she thought was odd. Later, Ms Winson described seeing Butler’s blank expression as Ellie was taken to an ambulance outside. She said: ‘As they were bringing the little girl out on a trolley paramedics were working on her giving CPR. ‘The mother was severely distressed and holding on to the trolley. ‘The father was behind. He had no expression on his face. There was nothing. When Gray came to collect the dog a couple of days later, she ‘broke down in tears’, she said. Ms Cook said that Gray had told her Ellie ‘fell off her bed and hit her head on a radiator’. This is the moment Ellie Butler’s panicking mother hailed a cab home after her husband allegedly told her he had murdered their daughter. The prosecution say Gray – who had raced out of work shortly before – was talking to her partner Ben Butler, also 36, who had phoned her minutes before to tell him that he had killed their little girl, Ellie. The jury was told how, after arriving home an hour later, Gray spent another 60 minutes helping Butler stage a scene in Ellie’s bedroom to make it appear as though the youngster had died in a tragic fall. He said: ‘She seemed keen and desperate to get a cab. The jury were also shown CCTV footage of Gray’s desperate dash home amid a flurry of phone calls and texts with Butler. The court was told Butler first tried to call at 12.46pm but was diverted to voicemail. Seconds later, he texted ‘answer’. Two minutes later, Gray was caught on camera hurrying out of her office at 20 Old Bailey, before dashing across the street running past the court – where she is now standing trial – to hail down the taxi. Just 11 months after being returned to the ‘toxic’ family home, the little girl was found dead on her bedroom floor with injuries usually associated with car crash victims. Ed Brown QC, prosecuting, told the jury: ‘In 2007, when she was six weeks old, she was taken to hospital with serious head injuries. ‘Ben Butler was charged with assaulting her and causing those injuries. Ben Butler was tried and convicted by the jury. However, he appealed and his conviction was quashed by the Court of Appeal on June 17, 2010. ‘By then Ellie had been fostered and proceedings were commenced in the High Court by Ben Butler and Jennie Gray for the return of Ellie to their care. Those proceedings were successful. 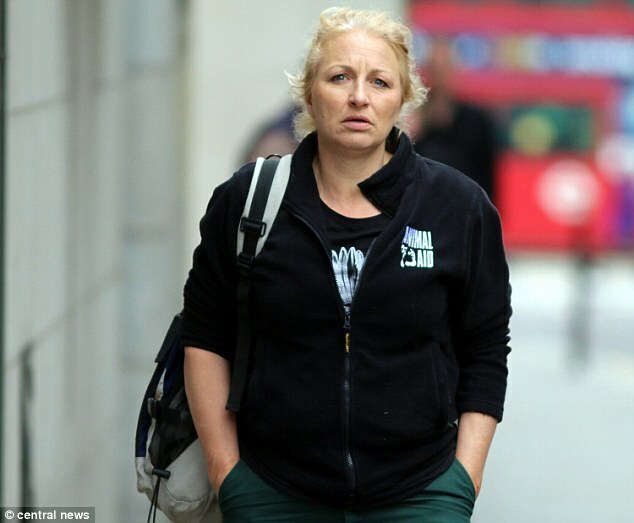 Text messages read out in court revealed the ‘torrent of verbal abuse’ which Ben Butler regularly unleashed on his subservient partner, including called her a ‘dog w****, ‘fat loser’ and an ‘ugly b****’. Butler, 35, repeatedly sent angry messages to his partner Jennie Gray, threatening violence, criticising her comments and even once saying: ‘Stay out of my way’. The exchange of messages also showed Butler’s ‘expressions of hatred towards Ellie’ and how ‘her very existence in his life caused frustration and anger in him’. Two minutes later he said: ‘if u dont do wot I want im bashing u.’ In other texts, Butler says he ‘can’t cope’, is ‘in a rage’ or ‘ready to flip’. Reading the messages to the jury, prosecutor Ed Brown said Gray responded by trying to appease him, telling Butler: ‘I luv U and want U.’ Another sent in August said: ‘Just so U know – I am obsessed and in awe of U! In a later text, she wrote: ‘I would die for U x’. She even carried out Google searches such as ‘magic spell to make him love me again’ and ‘magic spell to stop his hate’, the court was told. Gray’s diary entries, found torn up in the communal bins following Ellie’s death, were also read out to jurors. The prosecutor said Ellie’s behaviour was also a concern. Internet searches on a laptop used by Gray showed searches for ‘six year old urinating to be bad’ and ‘six year old hears a voice in her head’. A hand-written note entitled ‘Ellie’s behaviour’ listed points including ‘feel you can’t trust her’ and ‘we feel like she is aware she is doing this’.